The Government is giving £4.85m to BRIGIT, a consortium co-ordinated by the John Innes Centre, to enhance UK surveillance and response to Xylella fastidiosa. Parliamentary Under-Secretary of State Lord Henley has announced funding for a bacterial plant diseases research programme supported by UK Research and Innovation’s Strategic Priorities Fund. The first phase of this investment initiates a UK-wide consortium to prepare for the possible introduction and spread of Xylella fastidiosa into the UK. 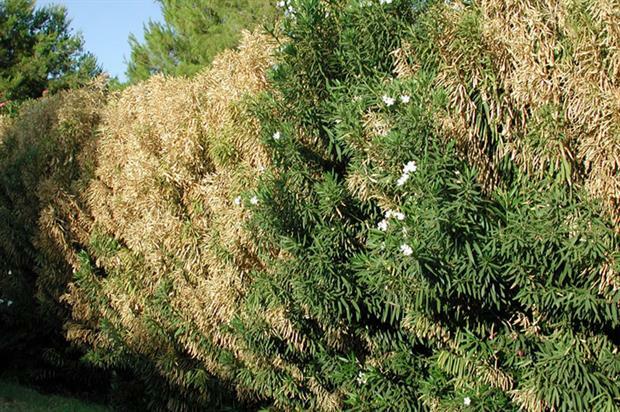 The programme aims to improve methods of diagnosis and detection of Xylella, to identify factors that could lead to its spread, and to prepare to minimise the risk of the pathogen to the UK. The bacterial plant diseases programme is a £17.7m collaboration between UK Research and Innovation Councils, the Biotechnology and Biological Sciences Research Council (BBSRC) and the Natural Environment Research Council (NERC) – together with Defra and the Scottish Government who are providing £1.1m of additional funding. Chief plant health officer Professor Nicola Spence said: "I am delighted that UKRI, together with co-funders Defra and the Scottish Government, has agreed to fund this crucial research which will help us to better control bacterial plant diseases in the future. Protecting the UK’s plants from pests and diseases remains one of my Department’s highest priorities, and we need robust science to underpin our actions to combat these threats. 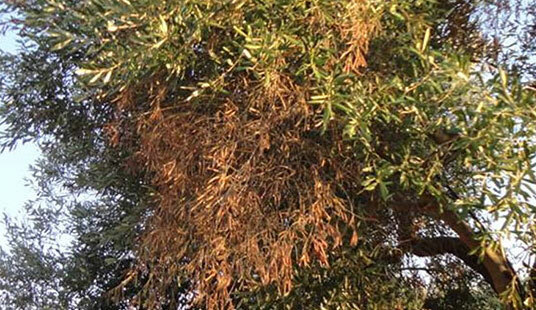 "Xylella fastidiosa is one such bacterial disease and will form the focus of the first phase of the research programme. The knowledge gained through this programme should assist us in further optimising our ongoing surveillance and ensure that our contingency plans are underpinned by the most up-to-date evidence available." Professor Saskia Hogenhout, project leader at the John Innes Centre and principal investigator of BRIGIT, said: "Despite the impact of this disease, we know very little about how the bacteria might spread in Northern Europe; the majority of research on Xylella and its insect vectors has been done in warmer southern climates. We believe this consortium is much-needed, bringing a joined-up approach to tackle a potentially devastating plant disease. "Thousands of plants are imported into the UK every day and we need to increase knowledge to understand how the disease may spread in the UK if it is introduced." A focus will be introducing and improving best practice in the horticultural trade, to mitigate the impact of any introduction. Professor Melanie Welham, Executive Chair of BBSRC added, "BBSRC is supporting this important collaborative project to improve the methods of diagnosis and detection of Xylella. Although there hasn’t been a case reported in the UK yet, we can take positive action to understand more, and mitigate the spread of this devastating plant pathogen." The Consortium includes: National Museum Wales, Centre for Ecology & Hydrology, Fera Science, Forest Research, RHS, Science and Advice for Scottish Agriculture, University of Salford, University of Stirling, John Innes Centre and University of Sussex. The consortium will collaborate with international scientists and organisations, including the University of Lisbon on further characterisation of the insect vector. Package two will be to improve various aspects of detection of X. fastidiosa in plants and insect vectors. Fera science Ltd will co-ordinate work within BRIGIT on targeted sampling and diagnostic sensitivity for more reliable detection of the bacteria in diverse plant and tree species. New diagnostic techniques will be explored to rapidly detect sources of introduction. Investigating insect vector biology will generate a better understanding of the biology of the estimated 20 xylem-feeding insect species that may transmit X. fastidiosa in the UK. The geographic distribution of these insect species and the plant species they colonise across Europe will be investigated. Genetic population structures of these species will be captured to identify insect migration routes between habitats and across the UK.